Wood sorrel, or oxalis, is a medium-sized wild edible weed that thrives in most areas across Canada and the U.S. The flowers of this plant can be used to obtain yellow, orange, and red to brown dyes. Oxalis, another common name for this plant, literally means "sour" and is named as such due to its oxalic acid content. Many domesticated vegetables, including spinach and broccoli, also contain oxalic acid, which is considered toxic when consumed in large quantities because it inhibits the absorption of calcium. Oxalic acid is not considered a problem when consumed moderately and with a varied diet, however people with gout, rheumatism, arthritis, hyperacidity and kidney stones should avoid it. Distinguishing Features: The leaves of this wild edible plant slightly resemble a shamrock. Although there are several sorrels, the wood sorrel is distinctive in that the seed pods bend sharply upward on their stalks, and the stalks also grow at a sharp angle from the main stalk. Angels of both are about at 90 degrees. 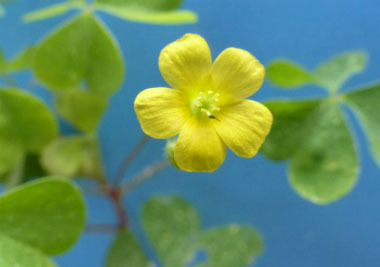 Flowers: The wood sorrel flower is yellow has five petals and it is about 1 to 1.5 cm wide. The flower has ten stamens and an erect, pencil-like pistil. It can be found blooming from May to October. 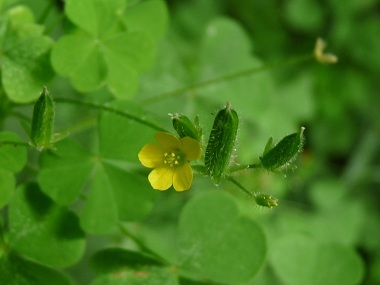 Fields of Nutrition has medicinal benefits and vitamin/mineral content of Wood Sorrel. Height: This edible plant usually grows to between 10 and 35 centimetres high. Habitat: Wood sorrel prefers moist soil, and partial shade. 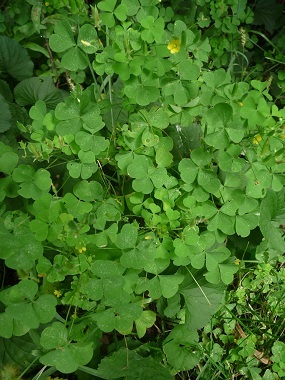 Patches of wood sorrel are prevalent on forest floors, and are often found near wild violets, cleavers, and wild onions. Edible parts: Wood sorrel is an incredible thirst quencher and is refreshing to eat. The leaves, flowers, and immature green seed pods are all edible having a mild sour flavour that some say resemble lemons. Wood sorrel can be added to salads, used in soups, sauces and it can also be used as a seasoning. Wood sorrel tea when cooled can make a refreshing beverage especially when sweetened with honey. 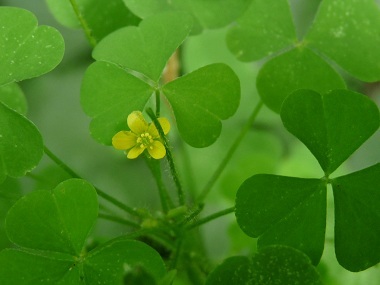 In moderate dosages, wood sorrel is cooling (refrigerant, febrifuge), diuretic, stomachic (soothing to the stomach, relieves indigestion), astringent, and catalytic.